Here it is. Football season. My favorite time of year. 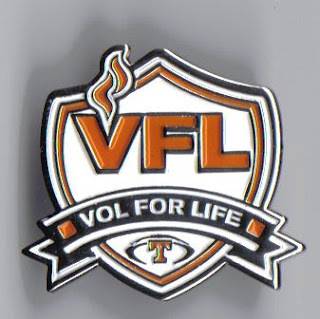 My favorite team is the University of Tennessee Volunteers. I was born a mile from the stadium at Ft. Sanders Hospital. So were my sons. My dad took me to my first game when I was 3 years old and I've been to too many games to count. I've taken both of my sons to games every year since they were 3. I love everything about it. The Vol family is indescribable. My friends and I always tailgate in the same spot. Sweet real estate right in the shadow of Neyland stadium. We all grew up going to Vols games. We've been coming together on Saturdays since Clinton was president. We all (our base group) have kids. My buddies, Charlie, Cliff, Richard, James, and myself. Last year, we had kids who played every level from grasshopper football all the way up to a Sr Lineman for William Blount (Cliff's son, Wildfire, AKA Justin). Most of us have played some football as some level at some point. We all live this game and BLEED ORANGE. I thought about writing this post about what the Volunteers mean to me. my game day experiences. The thrill of the team running through the T, The Vol Walk, Salute To The Hill, Vol Village, Tailgating, Rocky Top sung, in unison, by 100,000 people. Then, my friend Nikki forward me an email. It was written by an unknown (to me) author. I read it at my desk. I had chills. Eyes teared up. It was about me. And you, Vol fan. I thought it was absolutely beautiful. So I decided to post it here. If anyone knows the writer, I want to shake their hand. I will still write my own someday, but this must be shared. Go Vols! I am Tennessee. I am the 30 year old couple coming back to campus for the first time with both little ones in tow. One wears her orange and white cheerleader outfit; the other wears #16 even though he's too young to understand why. I am the 50 year old man who hoped no one saw tears in his eyes when the T was formed by the band. I was too choked even to sing "Rocky Top". For a moment I felt foolish and then I didn't care. God, I love this place. I am the 60 year old woman meeting her freshman grand-daughter who is now the 3rd generation of UT students in our family. Despite my age, I'd strap it on Saturday and hit someone if it weren't for my gender and this blasted arthritis. I am Tennessee and I have always believed I was different. You can see it when you look up into the stands. My orange is not the same as Florida's or Auburn's . But the differences go much deeper than my colors. Read my creed. What other school has one? I genuinely believe in these things.To be a real Tennessee man or woman speaks of character, not of geography. All are welcome to walk though my gates, not just the wealthy or the elite. Georgia and Alabama may have their nations, but we have always been family. Make no mistake, we loathe defeat, but even in defeat, we would rather be a Tennessee Vol than anything else. We are family and you are the sons of Heisman, the sons of Majors and Neyland.You come from a long line of brothers whose names include White, Gault, Wilson,Manning, Shuler, Nash and Mahelona. It is a great heritage. So this Saturday, when the warm ups are over and the prayers and amen spoken,when you hear my thunder growing in the stands above you, when you stand in the tunnel and the smoke begins to form, listen for my voice when you run on to my field. Behind the frenzy of the shakers and deafening roar, I will tell you something in a whisper you may miss. I will be telling you that you are my sons and I am proud of you for the way you wear the orange and white. I am telling you that you are my sons and I love you. Tennessee is so much more than a state or a school or a team or a degree. It is something that, once you have experienced it, will live inside of you forever and become a part of what makes up who you are. It is driving into town on a game day. You may have come from hundreds of miles away and as you get closer and closer to the city limits, you feel it rising inside of you. Other cars on the highway proudly display their Orange and White flags or magnets or car tags, and you honk and wave at them, because, for that one day, you are all on the same team. It is the smell in the air and the ritualistic act of tailgating...catching up with old friends, making new ones, and invitations from perfect strangers to try their ribs or watch their satellite TV showing all of the day's important match-ups...of course, all being secondary to the one that will occur in the great cathedral of Neyland Stadium later that day. It is the Vol Walk...where you might just see 300 pound men overcome with emotion and weeping with pride, because you have come there to cheer them on. As they walk by, you might exchange a glance with one or two of them, and you can see it in their eyes...it is going to be their day. It is the students...dressed in their best, because going to a Tennessee game is like going to church for Tennessee people....you show the same respect as you would if you were in God's house. 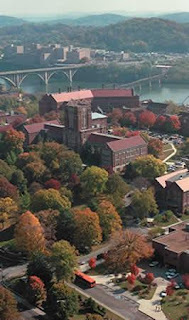 Those students remind you of the days when you were walking in their shoes and Tennessee was your home...but then you realize, in many ways, it is still and always will be HOME. 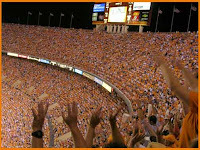 It is that lump that rises in your throat when the band plays Rocky Top as the"T" is formed. It is walking around on a "foreign" and sometimes hostile campus. You are easily identified (Tennessee people always are) and the enemy jeers and shouts things at you to mask their feelings of intimidation. But just then you happen upon a friend you have never met before. You know they are your friend by the colors they wear or the shaker in their hand. You exchange a "Go Vols" and a confident grin, because he/she knows what you know. It is when your heart leaps with every touchdown, field goal, sack, and interception...because those are our boys. And win or lose, they will always have our un-dying support. After all, it is those boys that you are really there for and not a coach or a logo or a trustee or a president. It is the complete and utter exhilaration of walking away victorious over a worthy opponent...that feeling of pride and accomplishment as if it were your own feet that had crossed the goal line scoring the last points yourself...that feeling of wanting to scream "Go Big Orange" at the top of your lungs and hug complete strangers...and then there is the ultimate high of defeating your most hated foes from across the state. No words can describe what this feels like, but you know because you have experienced it. It is the sheer agony of defeat as the last minutes tick off of the clock and you realize that all hope of a victory is gone. You feel like crying and maybe you do...then you hear the faint sounds of a cheer that grows louder and louder...."Its Great To Be A Tennessee Vol." It is knowing that year after year, no matter how things change in our hectic lives, you can always come back to "the Loveliest Place on the River"... the place where you came from...your home. It will probably look a little different and there will be new names on the backs of the jerseys, but deep down, no matter what, it is still the same. You still love it as much as you always have, because Tennessee is as much a part of you as your arms and your legs and the orange blood that runs through your veins. And, finally, it is the feeling you have right now as you read these lines....the anticipation inside of you, because you know its almost time....Its about to start all over again...but then it really never goes away, does it? Unknown Author... But it's all of us Vols fans, isn't it?